For many people, authentic life starts at the time of death – not our own, but someone else’s. This is so true for me. It was the murder of my nephew that changed my whole life. Up until that time my lived was lived by following what others had either taught me or expected of me. The lesson I learned from my mother that drove me, was to have a career that earned a great income so that I would not be like her and end up homeless with her children. In her mind her only option was to return to a marriage that she had left behind because it would provide support for her children. At first after my nephew died, it was all about helping my sister survive the storm of grief that ripped her world into tiny pieces that we couldn’t put back together again. Then once we all knew that she while she wasn’t fully recovered she was surviving and learning what her new life would be, it was time to deal with my own grief. I knew that I wanted to bring something positive out of his death and so I started writing my way through my own changing and evolving world. I had wanted to be a writer since I was a small child. But I didn’t have any confidence to begin the journey. Each time my heart and soul drew me into that space I had a ready excuse as to why I couldn’t do it. I have four children to raise, a fulltime career and husband to take care of. So I would lie to myself about the reason why I didn’t have the time to write. First it was when the kids were all in school, then I would have time to write. Then it was when they all graduated high school, then I would have time to write. Then it was taking care of my dad who had retired early with disabilities, so now I had a new obligation to put off this dream of writing my own stories. Always there was something more important to be done. Besides I told myself, be realistic, “no one will want to read what you write”. As I wrote my way through changing myself and posted it on my personal page, I kept being told by others to do more. The secret of making dreams come true can be summarized in four C’s. They are curiosity, confidence, courage, and constancy; and the greatest of these is confidence. Self confidence is something that Walt Disney had to have had. He had businesses that failed and ended bankruptcy. He lost most of his employees and a big contract to a film producer that had been working with him. What he discovered and what I discovered was that when one door closes another opens. For him that lead to the creation of Mickey Mouse, who actually has his own star on the Hollywood Walk of Fame. For me, it was discovering that this dream that I had buried as not being worthy of was in fact possible. 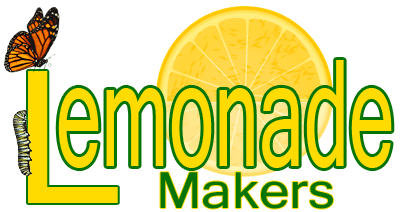 The writing on my personal page, created the self confidence to create the LemonadeMakers page here on Facebook and a website that we are slowly expanding to create even more material for our followers. As I walk this journey of following my dreams, I get ideas of where it might be taking me, but I don’t really know what I am becoming. I still feel constantly as though I am in the chrysalis and becoming something new. I am still being stretched into unknown realms. I am constantly learning, adapting and regrouping. I fall down on my face, but I keep getting back up. I brush off the dirt and dust and look in the mirror. It is the act of constantly letting go of the life I thought I should have, that I am able to embrace the life that is waiting for me. It is the constant asking of these three questions that keeps opening new doors of discovery for me. If I knew – honestly accepted – that I would succeed at whatever I did, what would I want to do next? If I knew – honestly accepted – that I had millions of dollars in the bank right this moment, what would I do next? If I knew – honestly accepted – that I only had 6 months life to live in this life, what would I do in that time frame with my life? When you ask those questions, sit with them in silence a few moments and see what bubbles up to the top for you. When you boil some sort of vegetable, a lot of times there is this film of stuff that spreads across the water. A sort of scum that I always ladle out of the boiling water. This is what happens when we sit in silence with a question. Our minds floats up a denial. It floats up a distraction. If floats up fears. Just look at them without judgement and scoop them out and let them settle into the earth. Now return to the silence and contemplation and see what bubbles up next. Write it down and see what else floats up to the top. Keep writing until you have a list of things that you would do next. Now take that list and put the items into two columns, column A and column B. So that if you had 10 items, you would now have 5 lines with an answer under column A and B for each line. Now ask yourself which draws me more – item A or item B and circle that answer for each of the five lines. Now you should have 5 circled items left. Do the same process, only now taking the first circle item to the next circled item, and keep picking between the choices until you have only one circled item. You now have the winning thing you would do next. Know what you are doing. Love what you are doing. And believe in what you are doing. So lets say just for sake of example it was learn to fly a plane. Now google local flying instructions and make appointments to interview them. Pick one and take your first lesson. It’s really that simple to let go of who you are, a dreamer with no action taken to accomplish his/her dreams, and a dreamer who makes a phone call and gets into a plane and takes their first lesson. If it turns out that you discover flying isn’t something that “rings your souls bell” then go back to your list and go through the items again to see what else might be the next dream to accomplish. Want to join with us in further exploration of living the life of your dreams? See below to check out our next event.